WHAT'S UP WITH EURO - LIBOR 2 MONTH RATES? Just scanning some of my normal indicators and found something odd in 2 month Euro-Libor rates. While everything in banking land looks and feels great (RIGHT!!!) 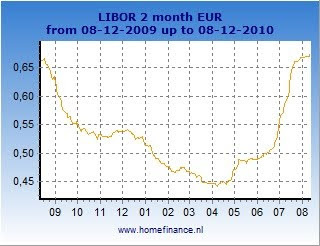 and all rates have been coming down for at least 5 to 6 weeks, the 2 month Euro-Libor rate has started to move higher on 8/5/2010. All other time periods continue to show funding rate improvement, so I don't want to over do the alarm here, but this kind of nugget would help us identify trouble in Europe if on the odd chance that perhaps the bank stress tests over there didn't really clear up anything. I mean, can you imagine a stress test where regulators didn't actually stress anything but the market just rallied because someone told them things were better? No, I can imagine anything like that either! Here is the data summary so you can see the trend in rates by day. I'll keep watching this as an indicator that banks begin to not trust each other. As concerns re-emerge about the health of sovereign country debt in Europe we'll see pressure on European banks too.